In approximately half a year the sounding rocket REXUS 25 is going to launch with our experiment on board. We are working hard on the preparations. 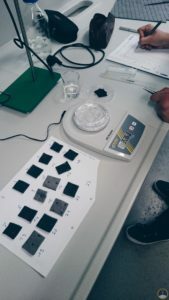 To get an overview of our experiment, you can see this very (!) basic setup diagram. The heart of the setup is the FlowCell, where the foraminifera lives. There are multiple ones, but we just plotted one to keep it simple. Further information about the FlowCell is available here. The FlowCell is connected to a water reservoir and water circulation is created by a pump. Both the FlowCell and measurement instruments are in the “Late Access module”. While the other modules are installed in the rocket long before launch, the late access module is mounted in the REXUS module short time before launch through a hatch. Due to that our foraminifera are not too long in the rocket and are less stressed. Moreover there is the electronic compartment which controls the measurements and recordings. The boards we populated at DFKI are in there. It is not a huge surprise that there is water in the FlowCell as well as in the water reservoir – but it is supposed to stay there. To protect electronics and other sensitive materials precautions need to be taken. “We install a water absorbent material in the Late Access module to catch possible water outflow. In this way we protect the other modules because water is not going well with electronics.”, explains our System Engineer Nils. 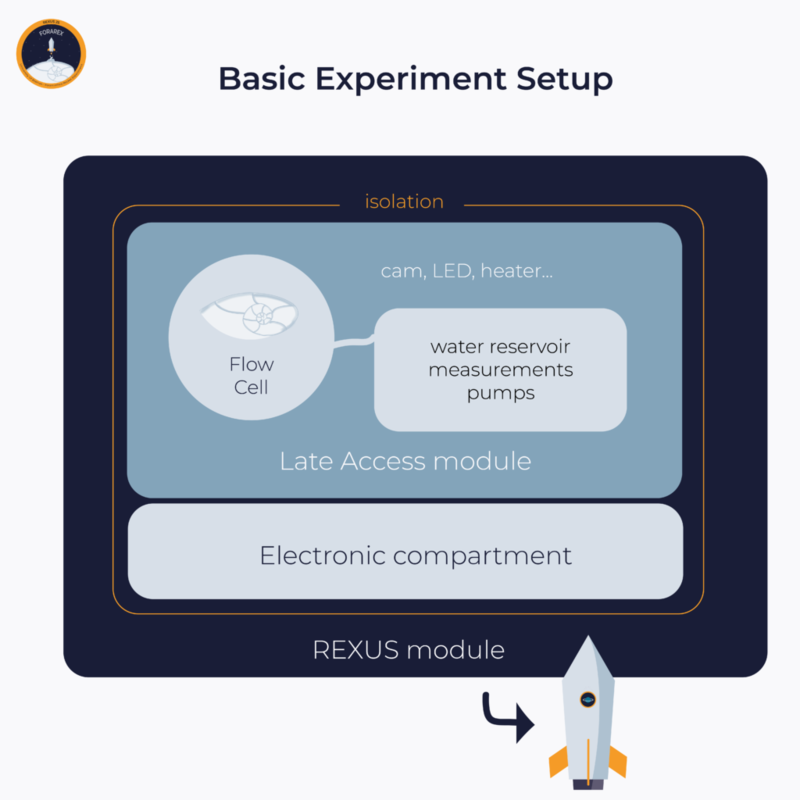 The REXUS manual requires that the water absorbent material is capable of absorbing 2 times the amount of water in the experiment. We need to verify that our material – a special fleece – can do that. Moreover we don’t use clean water but water with salt and other additives to create a nice home for the foraminifera. We did some test to be sure that the fleece can absorb our water mixture in the required amount. Luckily the test hat good results, so our water is good enough. 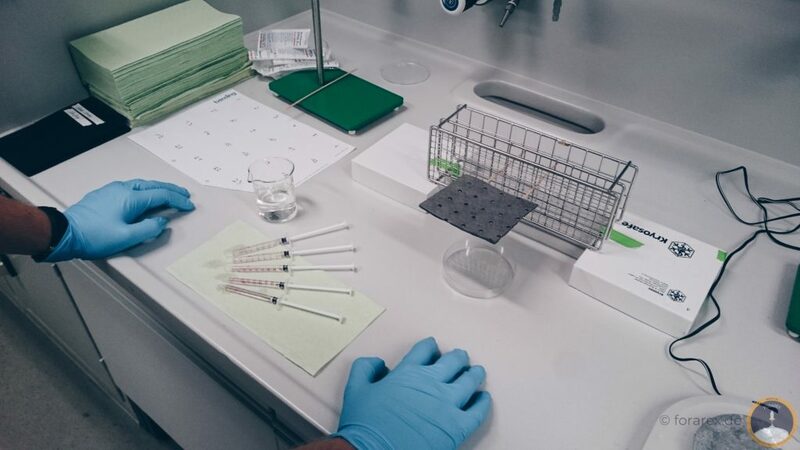 Now only one final test of the material is missing before verifying everything. 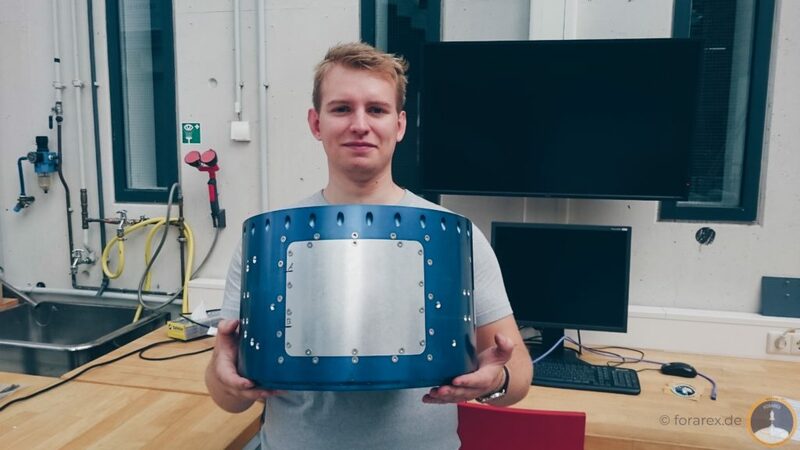 We received our REXUS-module! On the picture you can see the hatch that is used to mount the Late Access Module into the rocket. It will remain exciting.